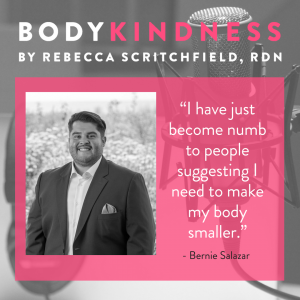 Bernie is back on the Body Kindness podcast and he brings news from the doctor’s office that makes Rebecca lose it (you’ll notice the bleeps!) Tune in as they discuss the insidious nature of weight stigma in medicine and what to do about it. Bernie and Rebecca also discuss Bernie’s reluctance to fully step into and embrace an identity with the word fat. You may also like to listen to Bernie’s last visit with the doctor that actually went well. What a difference the year makes. Here’s a great blog and handout from Ragen Chastain on what to say at the doctor’s office.